I recently traveled around the Bay Area, dropping in on some of our out-of-office training programs. First, on Friday, I joined KALW‘s transportation reporter, Eli Wirtschafter, at Solano State Prison in Vacaville, where he trains incarcerated men to produce audio stories that air on our station under the title Uncuffed. 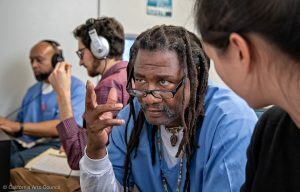 The program is situated in the media lab in the education department, where KALW has set up a makeshift recording studio and three editing stations. We worked with six guys, talking about how the program is evolving (and may end up on more stations), listening to a story our justice reporter made about a reunion of released citizens and prison guards on Alcatraz, and then editing pieces. The energy is really amazing, the students are extremely engaged, and it’s really a pleasure to work with the men and hear their stories. 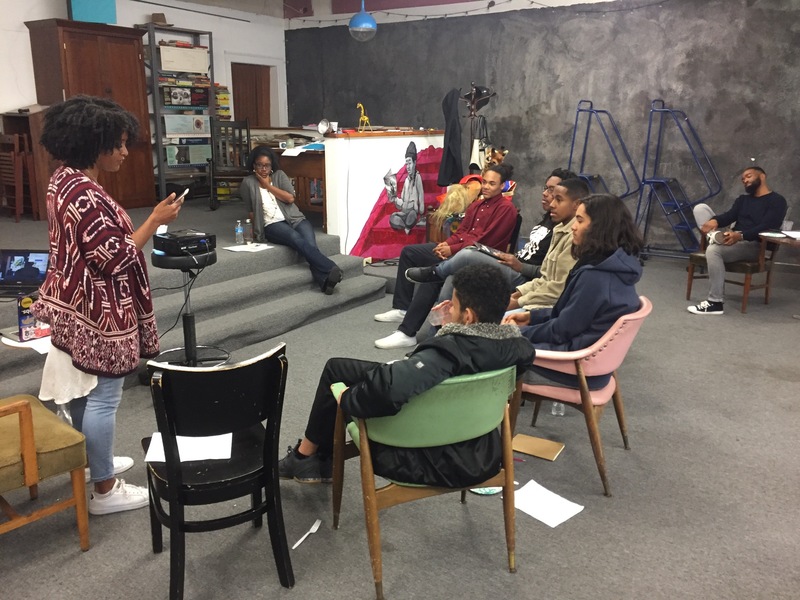 Ryan Nicole Peters works with students in the Black Joy writing program as part of Sights & Sounds of East Oakland. Then, on Saturday, I went to Chapter 510 & the Dept. of Make Believe, where two members of our Sights & Sounds of East Oakland team, Jeneé Darden and Ryan Nicole Peters, led a workshop on public speaking and performance with a student writing group called Black Joy. Ryan and Jeneé are both accomplished performers and terrific teachers, and the students were rapt. Again, I felt very privileged to have the chance to see really caring and attentive learning in action, and I had the chance to enjoy seeing and hearing the students as they each took a turn on stage, performing their own works. They’ll be on a much bigger stage on February 24, when they take part in the Black Joy Parade in Oakland. You see, KALW has been “my station” for nearly 10 years. When I first moved to San Francisco in 2009, I quickly identified where all of the NPR affiliates were on the dial and programmed the pre-sets on my kitchen radio accordingly. KALW was in spot #1. And, aside from Saturdays, I rarely changed the dial (sorry bluegrass buddies!). 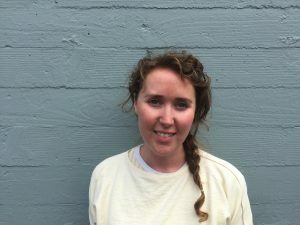 KALW reverberated with me in a way that the other stations did not. Because I could feel that they were smaller. Scrappier. More local. More personal. More willing to discuss radical ideas because they weren’t tied to bigger interests. As I listened, I found a growing love for the format of audio storytelling. I also grew curious about the way radio was made. I started noticing when a sigh was meaningful, or when someone had made an obvious, awkward edit. Thus began my radio-making dreams. Fast forward to this year, when I was accepted into the Audio Academy. Upon arrival, I felt an immediate YES. All of the ethics and soul of the station that I had heard for years, that had inspired my dreams, they were all true! The smallness, the scrappiness, the local focus, the personal authenticity of each piece, the freedom to explore ideas … these qualities were all transmitted through the air waves accurately! I felt an embrace of hope and a sigh of relief that I had found the help — the leg up that I need on this journey. We’re now at the halfway point in the program. There’s less instruction and more just doing the damn thing. Winter break invited all sorts of funny feelings. Guilt because I wasn’t working on audio while out of town. Questions about identity. What am I doing here? Am I ever going to be good enough to support myself in this field? We talk about these things in our seminars, sharing our insecurities with each other. Yes. I am! And only because I have support. The support that Audio Academy provides is real and tangible. 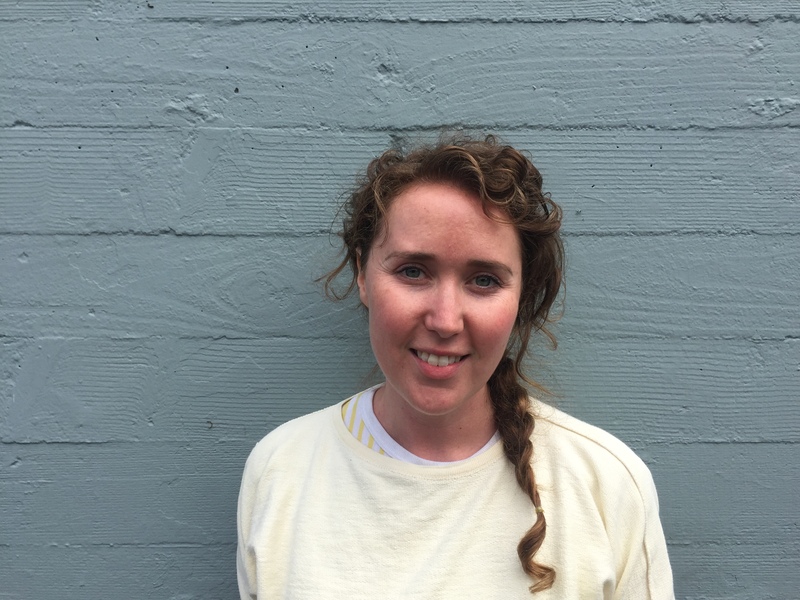 It’s a pep talk from my mentor, a moment of vulnerability shared with another AA fellow, or a practical editorial suggestion from KALW’s incredibly talented team of reporters. I am so lucky to be here! And I’m ready to get back to work. Catch ya on the airwaves!